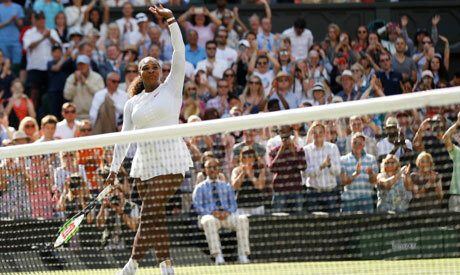 Serena Williams stayed on track for an eighth Wimbledon title as she fought back to beat Italian Camila Giorgi 3-6 6-3 6-4 in a fiercely contested quarter-final on Tuesday. For the first time in the tournament the 36-year-old was seriously challenged as unseeded Giorgi, playing in her first Grand Slam quarter-final, fought fire with fire to claim the opening set on Centre Court. Williams responded by raising the intensity level and began striking the ball with ferocious power to break Giorgi's serve for the first time on her way to levelling the match. World number 52 Giorgi dropped serve to love early in the decider but hung in gamely to at least make Williams serve to reach her 35th Grand Slam semi-final and 11th at Wimbledon. Williams stepped up to the line at 5-4 and brought up match point with an ace before completing victory when Giorgi could only push a forehand into the net. "Every time I play Giorgi she always plays that level so I knew going in it would not be an easy match," Williams, who will face German 13th seed Julia Goerges in the semi-finals, said shortly after walking off court. "After the first set I said 'okay let's go three sets', I just kept fighting." Williams is playing only her fourth tournament since returning to the Tour after giving birth to daughter Alexis Olympia nine months ago and arrived with a ranking of 181, although she was bumped up to 25th seed. After claiming a 19th consecutive match win at the tournament she won in 2015 and 2016 but missed last year, she said she still had a way to go to regain her top level. But with none of the top eight seeds left in the draw she is now a huge favourite to claim a 24th Grand Slam title and move level with Margaret Court on the all-time list. "I feel good, I felt like I did better today, I had to, but this is only my fourth tournament back so I don't feel any pressure and have to win this," she said. "I'm here just to prove that I'm back, and I feel like I'm back."